Creature Comforts has been supplying the Pet and Show market for over a decade. We are a trusted name in this profession and our aim is to please and obtain the more hard to get items. We travel the dog Show circuit on the North Island and look forward to the opportunity to meet with you at a Show near you. Check out our contact page to get in touch with us. We are also now pleased to announce we have imported trolleys with swivel wheels for easy maneuverabilty. 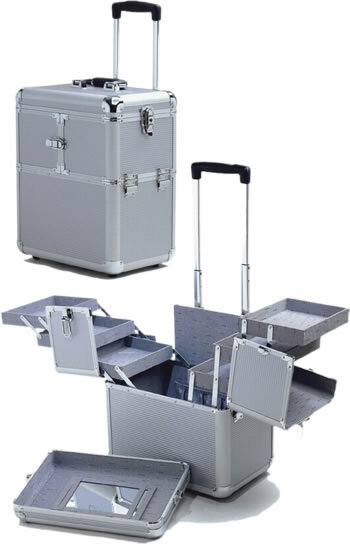 Soft Crates are well constructed, heavy duty folding soft crates. 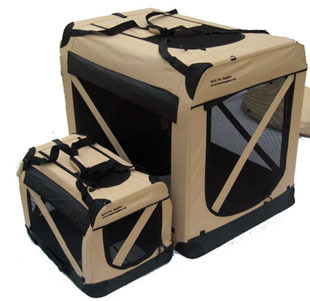 They come in multiple sizes suitable for all size dogs. Nozzle rotates 360°making it easy to be positioned at any angle! These C-Crate style Secura Pens are one of the most popular products in our range. 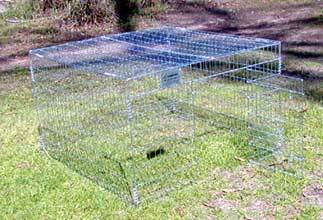 The Secura Pen is a free standing enclosure with a roof but no base, and comes in a full range of sizes to suit the smallest and largest of breeds. It can be erected on any surface (in less than 30 seconds), can be pegged to the ground for added security and then folds flat for ease of transportation. 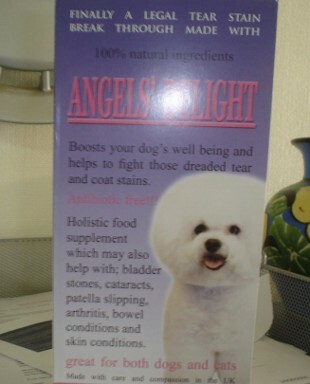 Angels Delight is made from 100% natural ingredients which boosts your dogs well being and helps to fight those dreaded tear and coat stains. It is antibiotic free. These armbands have layers of satin ribbon, a glittering crystal centrepiece and 4 Swarovski crystals at each side for that extra sparkle. They have a suspender clip for holding your entry number. A sturdy but fully adjustable elastic strap allows you to achieve a snug fit that stays in place - it won't slip down around your elbow. Total depth 25mm (1"). 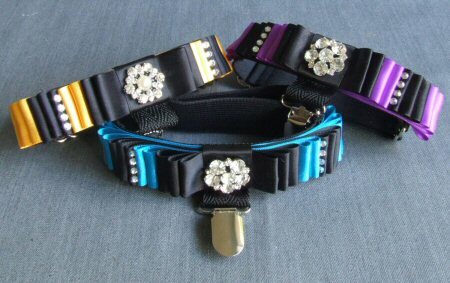 For those who love bling and want an armband with extra sparkle that really catches the eye - these clip armbands feature a strip of exquisite rhinestone trim set against black satin ribbon. There are two beautiful trim styles to choose from. These armbands have a sturdy, fully adjustable elastic strap. This pocket-style armband is backed with leather-look vinyl and bound with satin ribbon. It has a 3D pleated pocket which makes it easy to slide number cards in and out in a hurry when showing multiple dogs. The sturdy but fully adjustable elastic strap allows you to achieve a snug fit that stays in place - it won't slip down around your elbow. 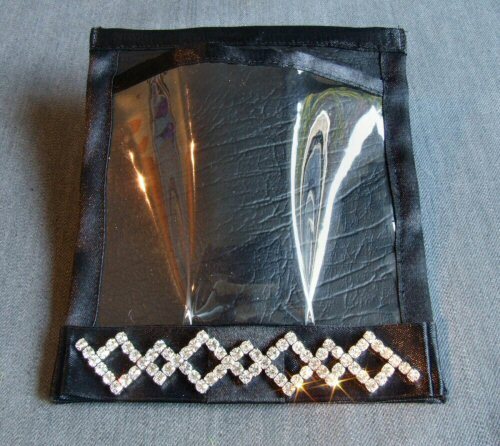 These bling on black pocket armbands feature a strip of exquisite rhinestone trim set against black satin ribbon. There are two beautiful trim styles to choose from. These stylish rosette-like badges are an attractive new way to display your entry numbers at dog shows. They feature a crystal centrepiece and a folded satin ribbon rosette in a variety of colours. They are backed by a brooch pin which can be attached to your lapel or waistband. 4ft long paracord slip lead featuring lightweight, sparkling engraved aluminium beads. Ring and slider bead adjust the size of the neck piece and hold firmly once in place. Unlike other slip leads they will never work loose if your dog pulls or twists. 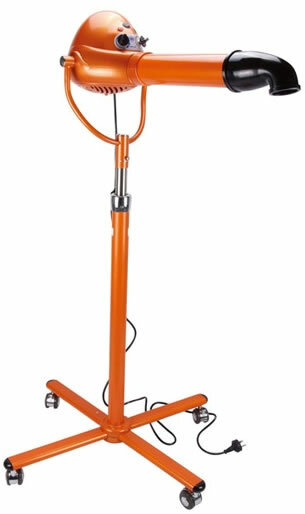 High quality swivel. Suitable for small to medium sized dogs. Optional extra is a padded satin neckband ("kindness"). 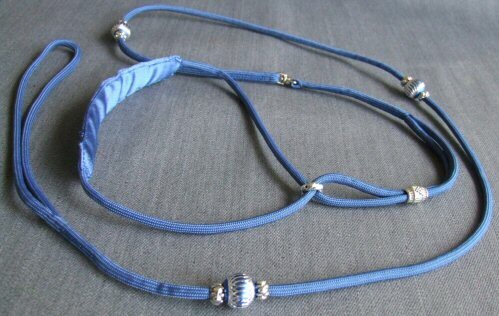 This beaded paracord lead is also available as a 3ft long clip lead. 4ft long paracord slip lead with three gorgeous rhinestone bead clusters. Ring and slider bead adjust the size of the neck piece and hold firmly once in place; unlike other slip leads they will never work loose if your dog pulls or twists. Suitable for small to medium size dogs. Optional extra is a padded satin neckband ("kindness"). 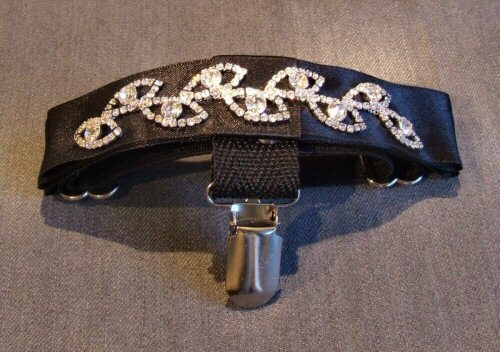 This rhinestone paracord lead is also available as a 3ft long clip lead. These handy bait bags come with an adjustable belt so they can be worn around the waist. They provide a clean and tidy way to keep your dog's favourite treats on hand without dirtying the lining of your jacket/trouser pockets etc. There are Velcro closures at the top edge to keep bait secure. The standard 25mm belt can be removed, allowing the bait bag to be threaded onto your own trouser belt if desired - ideal for men. Wider belt loops are available if required (does not come with wider belt). Oxford nylon lined with no exposed seams - simply turn inside out and wipe or brush clean. Water and grease-proof. The rhinestone bait bags are available in black only, and are adorned with a beautiful Swarovski rhinestone design, in up to two colours. The rosette bait bags are designed to match the number clip rosettes and feature a ribbon rosette with a crystal centrepiece.